Fluff & Tuff Nellie Giraffe is not an elephant. Now that it clear we can tell you that Nellie is a perfect companion for any dog, all Giraffes need a dog, fact! 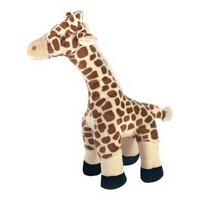 With her fabulous long neck for dogs' to take hold of, she's a great shape for flinging around or nuzzling up to. Nellie has packed her bags and is ready to join the circ...your home! The Fluff & Tuff Nellie Giraffe has double-stitched reinforced seams, sewn eyes, durable mesh inner lining for the under amour and a non-toxic fibre stuffing for your dog's enjoyment.